The Logitech K750 Solar Wireless Keyboard is a reliable and energy efficient keyboard that is solar-powered, so incredibly kind to the environment. The keyboard is capable of easily charging even in minimal light conditions that are typical of the UK weather, it cane ven stay charged for up to three months in total darkness, so you don’t have to change the batteries all the time. Plus you can quickly see exactly how much power you have left on the Logitech Solar App display, which continuously monitors both the power usage and the output. As well being eco-friendly in terms of its energy use, the Logitech K750 keyboard is also in terms of the materials used in the manufacture, as it has a PVC-free construction and is also fully recyclable box for a minimal carbon footprint. The sleek keyboard is also light weight and ergonomic, designed for quieter keystrokes to make it the ideal computing companion. Using the wireless 2.4Ghz channel, the K750 Solar Wireless Keyboard has along effective connection range and does not suffer much from the drop-outs and interference you get on cheaper models. In addition there is no software required for installation, you simply plug in the wireless receiver to a free USB port on your computer, and the keyboard is ready to use! The Logitech receiver also allows the connection of further other wireless devices so does not tie up the USB ports on your computer. 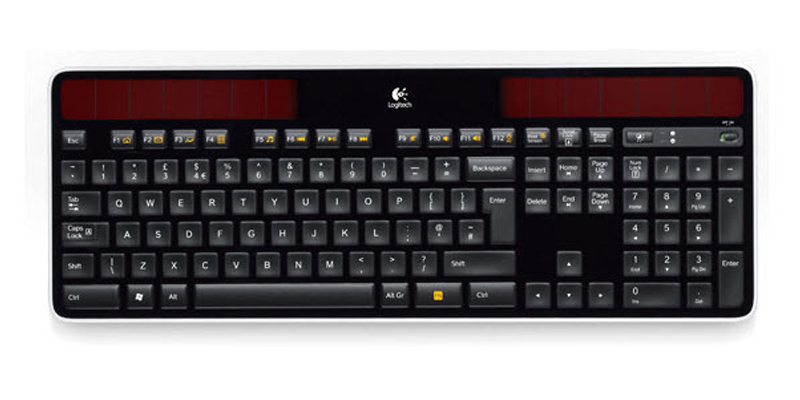 The Logitech K750 Solar Wireless Keyboard is designed as a Windows device, so please check before buying if your computer runs another operating system. The box contains the Logitech K750 Solar Wireless Keyboard, the wireless receiver, a wireless extender, plus a handy cleaning cloth to keep the keys clean and free of dust and debris!